A hematoma in these potential spaces can be an immediate life-threatening emergency, with potential for airway compromise. As a result, all medical staff involved in the management of airway emergencies should be aware of this rare condition. To understand the importance of a retropharyngeal hematoma, knowledge of the anatomy of the various fascial planes in the neck is necessary. These fascial planes allow for expansion in certain areas (known as potential spaces). The retropharyngeal space is found immediately posterior to the nasopharynx, oropharynx, hypopharynx, larynx, and trachea. Laterally, the space is continuous with the parapharyngeal space and bound by the carotid sheath. An image depicting retropharyngeal hematoma can be seen below. Lateral soft tissue radiograph of an elderly patient who presented with a retropharyngeal hematoma after a fall. Various precipitating factors have been described. These factors include bouts of coughing, sneezing, straining, vomiting, whiplash injury, blunt head and neck trauma, foreign body ingestion, retropharyngeal infection, carotid artery aneurysm, carotid sinus massage, internal jugular vein cannulation, metastatic disease, and coagulopathic states. Precipitating factors, such as episodes of coughing, sneezing, straining, and vomiting, indirectly contribute to a retropharyngeal hematoma by increasing venous pressure and causing rupture of the venous system. In traumatic cases, the hematoma is thought to be caused by a tear in the anterior longitudinal ligament, but it can also be due to bleeding from a cervical spinal fracture. The expanding hematoma may affect the airway at different levels as a result of mass effect. Because of the anatomic barriers described above, the bulk of the hematoma could be compressing the nasopharynx, oropharynx, hypopharynx, or esophagus. Thus, the obstruction could be at the level of the upper airway, at the cervical trachea, or at the intrathoracic trachea. This knowledge is significant, as a standard tracheostomy may not resolve the airway obstruction (see Treatment). Because the patient's history can be nonspecific, a high index of suspicion is needed to diagnose a retropharyngeal hematoma. The onset is usually acute but can also be insidious, and patients may present several days after the initial insult. The airway is the immediate concern, and appropriate management might initially preclude taking a full history and/or the examination. Because of the possibility of associated cervical spinal fracture, appropriate attention should also be given to immobilizing the cervical spine in traumatic cases. Patients with retropharyngeal hematoma may present with a history of trauma to the head and neck area (especially hyperextension of the neck), but the history often includes details that seem trivial, such as episodes of coughing, sneezing, or straining. Patients may experience sore throat, difficulty swallowing (dysphagia), odynophagia, jaw stiffness (trismus), or neck stiffness (torticollis). Patients also may experience having a muffled voice, the sensation of a lump in the throat, and/or pain in the back and shoulders upon swallowing. Other precipitating factors include foreign body ingestion, retropharyngeal infection, carotid artery aneurysm, carotid sinus massage, recent internal jugular vein cannulation, metastatic disease, and coagulopathic states. These factors should be excluded in the history, but the onset may be spontaneous. Difficulty breathing is an ominous symptom that signifies impending airway obstruction. The initial assessment should include an evaluation of the patient's pulse rate, respiratory rate, temperature, blood pressure, and pulse oximetry reading. The patient's voice might resemble a hot-potato voice (dysphonia). Patients with total dysphagia are spitting out their own saliva. Patients in respiratory distress, those who present with stridor (noisy inspiration with or without noisy expiration), or those with drooling should be considered to have airway compromise until proven otherwise. Patients assume the position that provides maximum airway patency; this may be supine with their head extended or sitting up and holding onto railings to aid the accessory breathing muscles. Do not force patients to alter their position, as this may worsen their respiratory distress. On examination, the neck's range of movement may be limited. Ecchymosis may be detected on the lateral aspect. Palpation may reveal a mass, which is usually unilateral. Examination of the oral cavity and pharynx may be precluded by trismus. This is due to blood collecting next to the pterygoid muscles. On inspection of the oral cavity (usually with a tongue depressor), a mass may be visualized in the posterior pharyngeal wall of the oropharynx. This mass tends to be off the midline because of the presence of a midline raphe caused by the superior constrictor muscle. A midline swelling suggests a hematoma in the prevertebral space, behind the dividing raphe. Movement of the laryngeal cartilages may induce or worsen the patient's pain. Inspection with a flexible nasoendoscope is especially helpful to objectively assess the airway. The obstruction may extend lower than the cervical trachea. A mass in the posterior pharyngeal wall should be assessed for extension and reassessed later during further monitoring. Exclude other local causes and vocal cord palsies. Nasoendoscopy will also provide an idea of what the anesthetist might expect during intubation. Physical assessment should be ongoing as the patient's condition may deteriorate hours or days after initial presentation. Not all retropharyngeal hematomas warrant surgical intervention. A patient with a small nonexpanding hematoma should be observed in the hospital, and the hematoma should be regularly assessed via clinical examination, flexible nasoendoscopy, or radiologic study. Actual or impending airway obstruction is best treated with tracheotomy, as intubation with a small-lumen tube may not pass the inferior limit of the hematoma. High-pressure ventilation may be needed and may result in poor gaseous exchange. A longer-than-usual tracheotomy tube might be needed. Surgical evacuation of the hematoma is necessary when the patient has a life-threatening airway obstruction, a rapidly expanding hematoma, or an inability to achieve ventilation after tracheostomy. The advised approach is a lateral approach for pharyngotomy in which the anterior aspect of the carotid sheath is passed. The deep neck spaces are formed by fascial planes, which divide the neck into real and potential spaces. The fascial planes are divided into superficial and deep divisions. The superficial cervical fascia surrounds the muscles of facial expression. The superficial musculoaponeurotic system (SMAS) is included in this layer and extends from the skull to the axillae and chest. It lies below the dermis. Deep to this fascia is a layer that contains fat, lymphatics, and neurovascular bundles. This area is distinct from the deep neck spaces. The deep cervical fascia envelops the deep neck spaces and is further divided into 3 layers: the superficial, the middle, and the deep layers of the deep cervical fascia. The carotid sheath is formed by contributions from all 3. The superficial layer of the deep cervical fascia is an investing fascia that surrounds the neck. It covers the sternocleidomastoid muscle, trapezius, the muscles of mastication, and the submandibular and parotid glands. Its superior aspect is limited by the nuchal ridge, mandible, zygoma, mastoid, and hyoid bones. Inferiorly, it extends to the clavicles, sternum, scapula, hyoid, and acromion. This layer contributes to the fascia that covers the digastric muscle and to the lateral aspect of the carotid sheath. It envelops the anterior belly of the digastric muscle and forms the floor of the submandibular space. Laterally, this fascia helps to define the parotid and masticator spaces. The middle layer of the deep cervical fascia has 2 divisions: muscular and visceral. The muscular division surrounds the strap muscles (ie, sternohyoid, sternothyroid, thyrohyoid, omohyoid). The visceral division covers the constrictor muscles of the pharynx and esophagus, the larynx, trachea, and thyroid gland. In doing so, it creates the anterior wall of the retropharyngeal space. Both divisions contribute to the formation of the carotid sheath. The middle layer attaches to the base of the skull superiorly and extends inferiorly as low as the pericardium by means of the carotid sheath. Some authors refer to the middle layer as the pretracheal fascia. The deep layer of the deep cervical fascia is also subdivided in layers: prevertebral and alar. The prevertebral division adheres to the anterior aspect of the vertebral bodies and extends laterally to the transverse processes of the vertebrae. The alar division lies between the prevertebral division and the visceral division of the middle layer and defines the posterior border of the retropharyngeal space. It surrounds the deep neck muscles and contributes to the carotid sheath. The muscular division of the middle layer of the deep cervical fascia fuses with the alar division of the deep layer of the deep cervical fascia at the level of T1-2. The carotid sheath is a pipelike fibrous sheath that extends from the base of skull to the thorax. It is composed of all 3 of the aforementioned layers. It contains the common carotid artery, the internal jugular vein, and the vagus nerve. Within the deep regions of the neck are 11 spaces created by planes between the fascial layers. These spaces may be real or potential and may expand when pus separates the layers of fascia. The deep neck spaces communicate with each other, forming avenues by which blood or infections may spread. The relevant spaces are described briefly below. The parapharyngeal space (ie, lateral pharyngeal space, pharyngomaxillary space, pterygomaxillary space, pterygopharyngeal space) is in the shape of an inverted pyramid bounded by multiple components of the fascial system. The inferior boundary of this space is the lesser cornua of the hyoid bone. The entire space is situated superior to the hyoid. The superior boundary of the space is the skull base. Its medial boundary is the pharynx and its overlying fascia. Laterally, the space is limited by the superficial layer of the deep cervical fascia that overlies the mandible, medial pterygoids, and parotid. The posterior border is medially formed by the prevertebral division of the deep layer and by the posterior aspect of the carotid sheath at the posterolateral corner. The anterior boundary is the interpterygoid fascia and the pterygomandibular raphe. The parapharyngeal space can be subdivided into anterior and posterior compartments by a line that extends from the medial aspect of the medial pterygoid plate to the styloid process. The prestyloid (anterior) part contains the maxillary artery, inferior alveolar nerve, lingual nerve, and auriculotemporal nerve. The poststyloid (posterior) compartment contains the carotid sheath (ie, carotid artery, internal jugular vein, vagus nerve) and the glossopharyngeal and hypoglossal nerves, sympathetic chain, and lymphatics. It also contains the accessory nerve, which is in a relatively safe position behind the sternocleidomastoid muscle at this level. The parapharyngeal space communicates posteromedially with the retropharyngeal space and inferiorly with the submandibular space. Laterally, it is connected to the masticator space. The carotid sheath travels through this space into the chest. This space provides a central connection for all other deep neck spaces. It is often involved by lateral extension of peritonsillar abscesses and was the most commonly affected space before the advent of modern antibiotics. Some consider the retropharyngeal space a third medial compartment in the parapharyngeal space because the 2 communicate laterally. It lies between the visceral division of the middle layer of the deep cervical fascia and the alar division of the deep layer of deep cervical fascia posteriorly. It extends from the skull base to the tracheal bifurcation around T4, where the visceral and alar divisions fuse. It contains mainly lymphatics. The retropharyngeal space is found immediately posterior to the nasopharynx, oropharynx, hypopharynx, larynx, and trachea. A hematoma in the space may push forward and occlude the airway at the level of the pharynx, appearing as anterior displacement of one or both sides of the posterior pharyngeal wall due to the midline fascial raphe. The prevertebral space is located anterior to the vertebral bodies and posterior to the prevertebral division of the deep layer of the deep cervical fascia. It lies just posterior to the danger space (see below). Laterally, it is bounded by the fusion of the prevertebral fascia with the transverse processes of the vertebral bodies. It extends from the skull base to the coccyx. The danger space is just posterior to the retropharyngeal space and anterior to the prevertebral space, between the alar and prevertebral divisions of the deep layer of the deep cervical fascia. It extends from the skull base to the posterior mediastinum and diaphragm. Laterally, it is limited by the fusion of the alar and prevertebral division with the transverse processes of the vertebrae. Some authors consider the danger space a component of the prevertebral space. The term danger space is derived from the fact that infection in this space tends to spread rapidly because of the loose areolar tissue that occupies this region. This spread can lead to mediastinitis, empyema, and sepsis. For an excellent description of all the fascial planes and deep neck spaces, see the Medscape Reference article Deep Neck Infections. Surgical drainage of deep neck space hematoma has no absolute contraindications. However, for patients with airway compromise due to the hematoma, the need to establish a safe airway takes priority and should be addressed before any surgical procedure is initiated. Once the airway is secured, surgical drainage can be performed. Ditkofsky N, Hanna T. Images in Clinical Medicine. Spontaneous Retropharyngeal Hematoma. N Engl J Med. 2016 Jan 21. 374 (3):e3. [Medline]. [Full Text]. Thomas MD, Torres A, Garcia-Polo J, et al. Life-threatening cervico-mediastinal haematoma after carotid sinus massage. J Laryngol Otol. 1991 May. 105(5):381-3. [Medline]. Munoz A, Fischbein NJ, de Vergas J, et al. Spontaneous retropharyngeal hematoma: diagnosis by MR imaging. AJNR Am J Neuroradiol. 2001 Jun-Jul. 22(6):1209-11. [Medline]. [Full Text]. Higa K, Hirata K, Hirota K, Nitahara K, Shono S. Retropharyngeal hematoma after stellate ganglion block: Analysis of 27 patients reported in the literature. Anesthesiology. 2006 Dec. 105(6):1238-45; discussion 5A-6A. [Medline]. Ha DH, Oh SK. Cervical Prevertebral Hematoma - A Rare Complication of Acupuncture Therapy: A Case Report. J Korean Soc Spine Surg. 2009. 16:290-293. O'Neill KR, Neuman B, Peters C, et al. Risk factors for postoperative retropharyngeal hematoma after anterior cervical spine surgery. Spine (Phila Pa 1976). 2014 Feb 15. 39(4):E246-52. [Medline]. Miao W, Ma X, Liang D, Sun Y. Treatment of hematomas after anterior cervical spine surgery: a retrospective study of 15 cases. Neurochirurgie. 2018 May 4. [Medline]. Song KJ, Choi BW, Lee DH, Lim DJ, Oh SY, Kim SS. 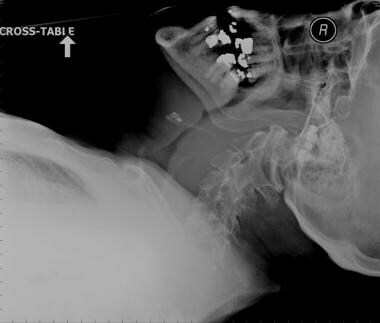 Acute airway obstruction due to postoperative retropharyngeal hematoma after anterior cervical fusion: a retrospective analysis. J Orthop Surg Res. 2017 Jan 26. 12 (1):19. [Medline]. [Full Text]. Karmacharya P, Pathak R, Ghimire S, et al. Upper Airway Hematoma Secondary to Warfarin Therapy: A Systematic Review of Reported Cases. N Am J Med Sci. 2015 Nov. 7 (11):494-502. [Medline]. [Full Text]. Inokuchi G, Kurita N, Baba M, Hata Y, Okuno T. Retropharyngeal hematoma from parathyroid hemorrhage in a hemodialysis patient. Auris Nasus Larynx. 2012 Oct. 39 (5):527-30. [Medline]. Macik BG, Hohneker J, Roberts HR, Griffin AM. Use of recombinant activated factor VII for treatment of a retropharyngeal hemorrhage in a hemophilic patient with a high titer inhibitor. Am J Hematol. 1989 Nov. 32(3):232-4. [Medline]. Cleiman P, Nemeth J, Vetere P. A significant cervical spine fracture: think of the airway. J Emerg Med. 2009 Jan 5. [Medline]. [Full Text]. Chest radiograph of the same patient as in the image above. Note the soft tissue shadow in the superior mediastinum. Disclosure: Paid Consultant/Speaker on Sinus Surgery Course Sponsored by Medtronic for: Medtronic. The authors and editors of Medscape Reference gratefully acknowledge the contributions of previous author Simon Watts, MBBS, to the development and writing of this article.